Adorable Apperance Cute and colorful appearance makes you mood feel better. Durable Materials Premium Poly Materials make more safety for your papers during travel. Tabs For Label 4 Tabs are allowed allow for adding handwritten labels, ensuring each section can be instantly identified for quick access. Expandable Pocket 5 Expanding Pocket holds lots of loose paperwork,class notes,documents even clipboard. Snap Closure Sturdy Snap Closure aviods your loose papers falling out and provide added security. SUPER-DURABLE MATERIALS--Poly material Acid Free hard file folders are very sturdy not easy to break and provide waterproof and tear-resistant performance. 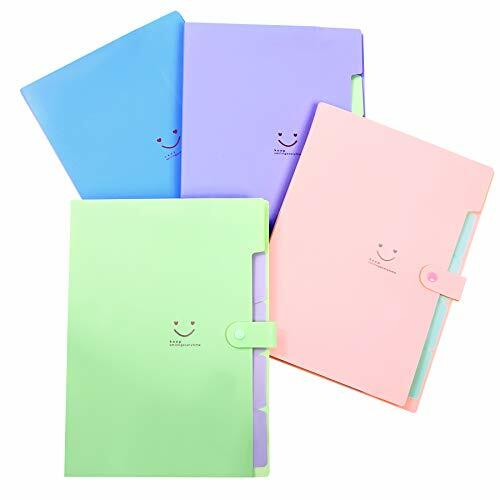 COMPACT AND PORTABLE --12.8"x9.5"x 0.7",Set of 4 with Color Purple Pink Blue Green.Letter Size folders are very compact to put in your backpack or hand bag and you will not feel any bulky. EFFICIENT FILES DIVIDERS-The file folders are divided into 5 Pockets with tabs ,where it is convenient for you to put your documents neatly and nothing gets crinkled or bent. EXPANDABLE AND BIG CAPACITY- 5 Pockets accordion file folders are so expandable to hold up to 150 -200 pages.Which help you save lots of time and more organized. FUNCTIONAL DOCUMENT HOLDERS--Expanding File folders are able to hold notes,projects ,documents,business expenses,tax paperwork And loose leaf paper.Great for Home,Office ,School, and As a personal gifts, souvenir, wedding planner and so on. If you have any questions about this product by Phyxin, contact us by completing and submitting the form below. If you are looking for a specif part number, please include it with your message.